Haider is a 2014 Bollywood crime drama film directed by Vishal Bhardwaj, and co-written by Basharat Peer and Bhardwaj. The film is a modern-day adaptation of William Shakespeare's tragedy Hamlet. The film produced by Siddharth Roy Kapur, Vishal Bhardwaj. It stars Shahid Kapoor, Shraddha Kapoor, Tabu, Kay Kay Menon, Irrfan Khan in lead roles and Narendra Jha, Kulbhushan Kharbanda, Lalit Parimoo, Aashish Vidyarthi, Aamir Bashir, Sumit Kaul, Rajat Bhagat plays a supporting roles. 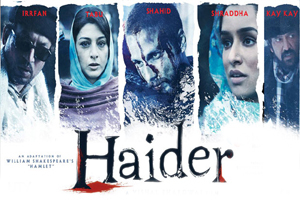 The music for Haider is composed by Vishal Bhardwaj and lyrics are penned by Gulzar, Faiz Ahmed Faiz. Here is the link of all the songs lyrics and videos of Haider.